A majority of Hispanic residents continue to be of Puerto Rican heritage: 69%. 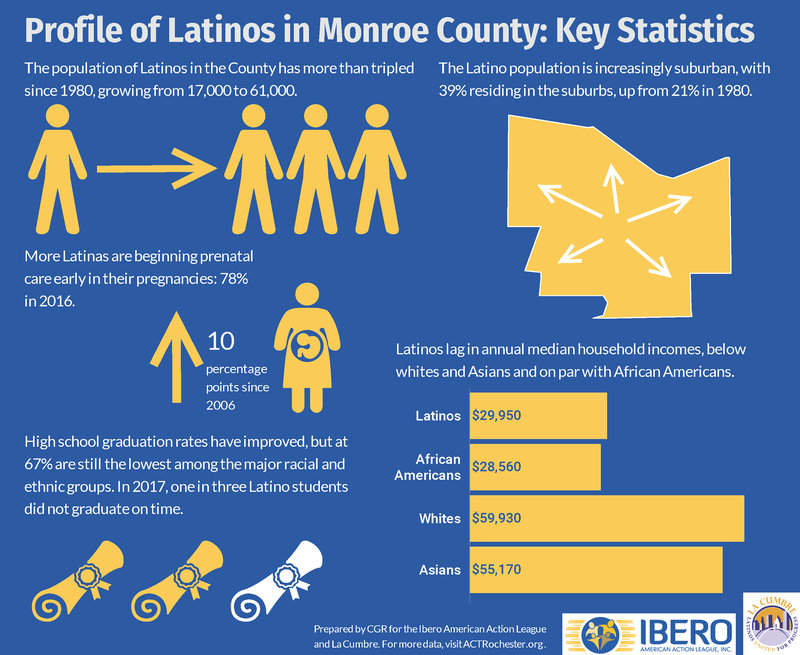 Hispanic and Latino residents had the youngest population in Monroe County, with 73% younger than 45. A majority of Monroe County Hispanic or Latinos spoke a language other than English, though that share declined from 74% in 2000 to 63% in 2012-16. In August 2017, ACT Rochester and Rochester Area Community Foundation released a report that documents how the status of African Americans and Latinos in the entire nine-county Rochester region significantly lags their counterparts in New York State and nationwide. “Hard Facts: Race and Ethnicity in the Nine-County Greater Rochester Area” examines the substantial gaps in educational and economic outcomes among persons of different racial and ethnic backgrounds. In early 2018, two "Hard Facts" Community Workshops were held in Rochester for caring and concerned citizens in the region to learn more about the details behind the "Hard Facts" data, to confront biases and to better identify systems that keep people of different racial and ethnic backgrounds from succeeding. Click on the "Hard Facts" cover to read the full report.